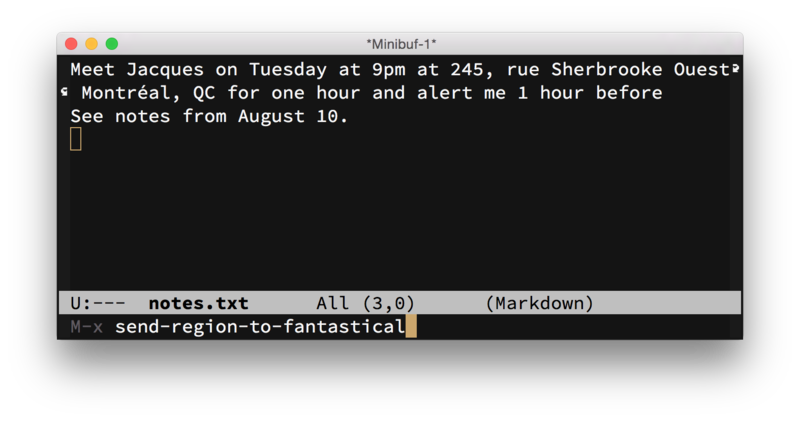 Last week, I wrote a function for sending tasks to OmniFocus from Emacs. This involved creating and running short AppleScript snippet on the fly to communicate with OmniFocus. Once this basic structure is available, it’s fairly easy to connect with other applications. The next application on my list was Fantastical 2. The send-region-to-fantastical function below takes first line of the region and sends it to Fantastical which opens the mini window (from the menu bar) and, using its natural language parsing, creates a new event which you can then review and add to your calendar. Any remaining lines in the region are added to the event as a note. Finally, it appends a note indicating that the task came from Emacs along with a timestamp. "Send the selected region to Fantastical. and subsequent lines as the event note." Note that this function calls applescript-quote-string, which is a function originally from omnifocus-capture.el from a previous post. You can download both functions together here: fantastical-capture.el.